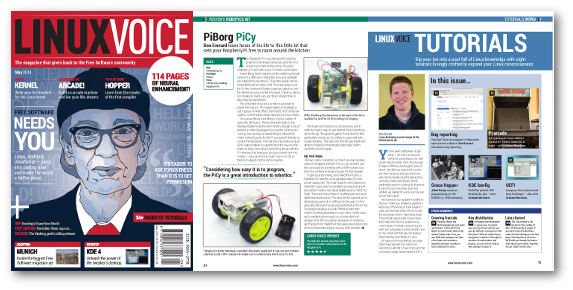 Read Linux Voice for free! Nine months after an issue has been on sale, we release it under the terms of the Creative Commons BY-SA license. So, everyone can redistribute and update the contents to benefit the community. Click the images below to download the issues we’ve already released. Discover Microsoft’s new “love” for Linux; explore the BBC’s Microbit gadget; learn about new browser technology from Mozilla; play music through Minecraft; and program in Rust. Turbo-charge your desktop environment; discover the new OS from the Linux Foundation; run an online office suite; build an OpenStack cloud; and master your Raspberry Pi. Set up a honeypot to trap hackers; explore the ELF executable file format; turn photos into 3D models with photogrammetry; add a HAT to your Raspberry Pi; and tame unruly CSS with SASS. Encrypt all your data; find the best scripting language; discover the CHIP $9 computer; control your web traffic using the Squid proxy server; and clone machines by transmitting hard drive images over the network. Build a Linux-powered smart home; discover what’s happening inside SUSE; explore super fast and lightweight web browsers; learn the black magic of ARM assembly; and write a cross-platform game using SVG. Use Linux smarter with our mega tips compendium; learn about how codes of conflict are changing the FOSS world; build a quiz machine with your Raspberry Pi; and monitor your servers over Bluetooth. Switch to 100% Free Software; explore the FSF-approved Libreboot X200 laptop; discover the internals of Android; create awesome games with Unity. Explore the hottest Linux desktops, build your own distro with SUSE Studio, share files and folders with Syncthing, and scan barcodes with your Raspberry Pi. Linux in the UK, OpenSUSE’s Build Service, Raspberry Pi-controlled cranes, KeePassX, WebAssembly, and the FSF’s John Sullivan. Linux projects galore, Google’s Summer of Code, lightning fast web serving with Nginx, how to write LibreOffice macros, and stop your Android phone from spying on you. Take back your privacy, understand how the Linux kernel works, play classic games on emulators, inside the OpenSUSE project and much more. The most awesome distros, bare-metal assembly programming, location tracking, Docker, Neil McGovern and much more. Hack the web, Raspberry Pi robots, Larry Wall, Node.js, encrypted hard drive volumes, and classic game console emulation. Inside the Ubuntu phone, start your own Free Software project, explore cryptocurrencies, how the x86 architecture works, and the best NAS distros on test. Everything you need to know about the Raspberry Pi 2, Bruce Schneier on “idiotic” government anti-encryption plans, and take back control of your smartphone with CyanogenMod. Why 2015 is the best year yet for Linux, Lennart Poettering on Systemd and flamewars, get started with assembly language, inside the Electronic Frontier Foundtion, and build your own media center. The history and future of Free Software, Asm.js explained, fun with the Linux Voice pub quiz, plus in-depth tutorials on penetration testing, backups with Deja Dup, and running Windows apps on Linux via Wine. How Linux beats Windows 10, fix Grub problems, understand how Systemd works, master the i3 tiling window manager, and do cool stuff with your Raspberry Pi. The 54 best Linux apps, Tim O’Reilly talks DRM and open data, inside the GNOME foundation, encrypted P2P communications with Tox, composing beautiful text with LaTeX, and building a mail server with Cyrus. Build your own distro, learn how password crackers work, control your TV from your smartphone, and back up your data securely. Find the perfect distro for you, overclock your Raspberry Pi, reverse engineer device drivers, and hear from the lead developer of Ubuntu’s Mir project. Eight awesome Raspberry Pi projects, the future of KDE, a chat with Wayland developer Daniel Stone, the history of free software forks, and Slackware fun. Explore the tricks of hackers/crackers, discover the awesomeness of NetHack, and learn how to compile software from source code with our in-depth guide. Find the best Ubuntu re-spin, build a Raspberry Pi-powered Mars rover, and harden your servers. Become a command line guru, search for comets with Python, and discover the awesome works of Alan Turing. Write your own kernel module, learn how Munich switched 15,000 workers to Linux, and fix UEFI boot problems. The launch issue! Secure your emails with PGP, make delicious beer with BrewPi, and understand how Bitcoin works. Really enjoy the podcasts, have for a long time. Special wishes to you all and sincere thanks for the great chats, talk about stuff, it’s quite entertaining. More chat about synth/audio please. Hi Graham. The Best Linux Mag in the UK. The first issue provided an Audio Edition of Linux Voice via a RSS feeds: Ogg Vorbis and MP3. Is there any intention to maintain this approach for other issues? I found it really useful to have an audio option. Thanks Guys. Please, so Technical Info : what are the softwares used to produce such a great quality Mag? Hoping to learn Scribus myself. I am quite happy to buy the latest hardcopy of “Linux Voice” in Malaysia for $46.50 MYR ( £7.18 GBP / $10.96 USD). I also think allowing readers to download “Linux Voice” for free, nine months after an issue has been on sale, under the terms of the Creative Commons BY-SA license is extremely generous. Does “Linux Voice” obtain any financial benefit from companies like “Nitroflare” which are currently downloading your latest October 2015 magazine for a fee? If “Linux Voice” does gain financially, are the sums involved worth the hit to your reputation, that you take by being associated with the “grubby” marketing policies employed by companies in this field? We’ve got nothing to do with Nitroflare. I hadn’t even heard of them until now. If someone is sharing non-CC copies of Linux Voice via that site, it’s illegal! I am about to chose to subscribe to either Linux Format or LinuxVoice. I’ve tried out several magazines, both English and Dutch speaking, here in Belgium, but had kind of decided to go for Linux Format. We used to have Amiga Format at home, so nostalgia had made me somewhat biased. 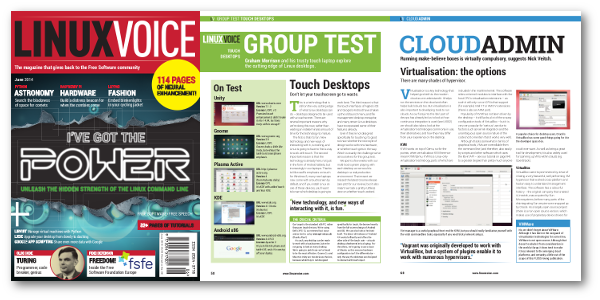 Two days ago I picked up LinuxVoice, and was surprised how packed it was with game reviews, a Blender tutorial, distro reviews, etc. Your website looks fresh, the editorial staff looks younger and more dynamic than from other magazines (or am I misaken? :-). So, my question is, how would you compare yourself to, for instance, Linux Format? What is your USP with regard to the contents? I hope my next favorite magazine will have more game reviews, more healthy comparative competition to e.g. Windows, more low-level tutorials and less enclosed CDs (we don’t need one of those every month, do we?). And congratulations for your splendid magazine! You can read more details in the english Wikipedia articles for LinuxVoice and LinuxFormat..
it has lots of things I enjoy (Core Tech is a main reason that I get this magazine every month, and I like your articles on things like programming languages and hardware (the x86 article for example). I also like some of your attitude, I really appreciate that you re-license your old issues, share money and knowledge, etc. Good work and thank you, guys. First, I wonder if I can post a comment or questions without having a login? I am still stuck at the Linux Distros Depot, but life is throwing curveballs at me with big rocks. I am learning late in life to follow my instincts instead of listening to the general tech pop culture. Anyway I never programmed in any programming language other than in my college assignments in classes (BASIC, FORTRAN77 & SLAM), which was in the last century. I have been using OpenOffice 4.1.1 – I think it was Oracle initially and then Apache since Microsoft stopped supporting Office 97. I believe I need to switch to LibreOffice. I have multiple older computers that I can install one or two Linux Distros. I have purchased Linux Voice and a variety of other Linux magazine brands that provide the CD/DVDs [honestly I liked getting the CD/DVD]. I was really impressed that I could boot the old HP Pavilion desktop PC, which was supposed to have MS Vista, but that is another story. In some regards it kind of became a thin-client. I need to pick at least two Linux distros, so I can learn and practice without fear of destroying my good computers. Argh! Each Linux magazine I read appears convoluted in the distro comparisons. Who’s On First? This Creative Commons Issues page has got stuck at Issue 12. Have you stopped releasing issues after 9 months? Just for anyone who – like me – enjoyed the DVDs that simplified installing linux, as Mike has explained, it just isn’t practical. I can attest to this as my local postie has decided that instead of keeping the packaged magazine as a parcel to be collected, no longer gives a sh*t about folding two copies around and squeezing it through my letterbox – hence even if it contained a pristine install DVD of ubuntu 16.04, it probably would have been shattered or at least broken/bent. Sad to say the days of trusting the postal office to deliver (at massively overpriced rates) no longer can ensure you would even recieve a working DVD anyway. My strongest advice would be to either use a DVD distributer such as LinuxWatch or whatever it is, or just download the iso itself. I purchased a great little USB device with linux on it at a reasonable price through distrowatch, and that wasn’t crushed, though i had to walk to my local PO to actually get it. Thank god it hadn’t been tried to squeeze through the letterbox. excellent plan to read LV and catch up! Are you going to be releasing anything beyond issue 23? Seems like it’s been months since you last released a new free issue for download. since September at least? Since joining up with Linux Magazine, LV has clearly given up this idea of releasing Creative Commons issues. The last one appears to be issue 27. What a shame. It was such a good idea. Farewell, Linux Voice. We haven’t given up on the idea; we just didn’t have time. We’re extremely busy writing content for Linux Magazine and making the free podcast, as well as trying to do our daily jobs. The more recent issues are online now. #Respect for your hard work….they live alone who live for others …..#Thanks and #Respect i will donate. you are the giver….#respect for providing free previous issues. After few modifications, I put my script in cron and checks every month if new magazine is uploaded or not. Hi Sandeep, no need to put it in cron — you have all the issues already! 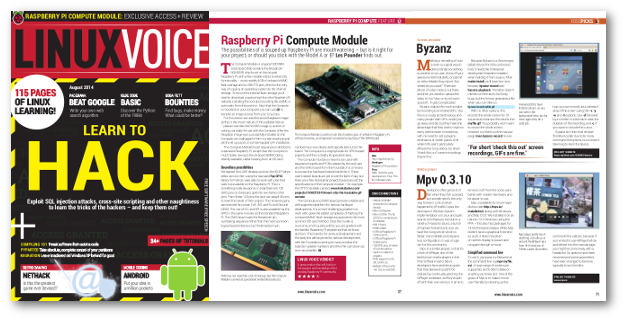 Issue 32 was the last issue of Linux Voice as a standalone magazine, so there’s nothing else for us to upload here. While I very much appreciate your making past issues available in pdf and e-book format, there are only five issues of the magazine in this format? The remainder seem to be in html, or with no download-ability at all. Am I missing something? If you are going to do it…do it. If not, you should remove it altogether. Is LV 32 the last and final edition?